Sometimes inspiration for a new recipe can come from as simple a thing as finding an undiscovered grocery store or a new grocery item. We were in the far north suburbs of Chicago on a visit and came across a store we had never heard of in one of the state’s more affluent neighborhoods and decided to check it out. Fortunately, they weren’t running credit checks at the door — yeah, it seemed that fancy — so inside we went. When you grocery shop in Chicago with so many other people you get used to things being rough around the edges or having the selection be a bit picked over. Here, everything was so shiny, clean, and stocked. The meat department was particularly lovely, every cut and creature you could imagine (especially if price was no issue). 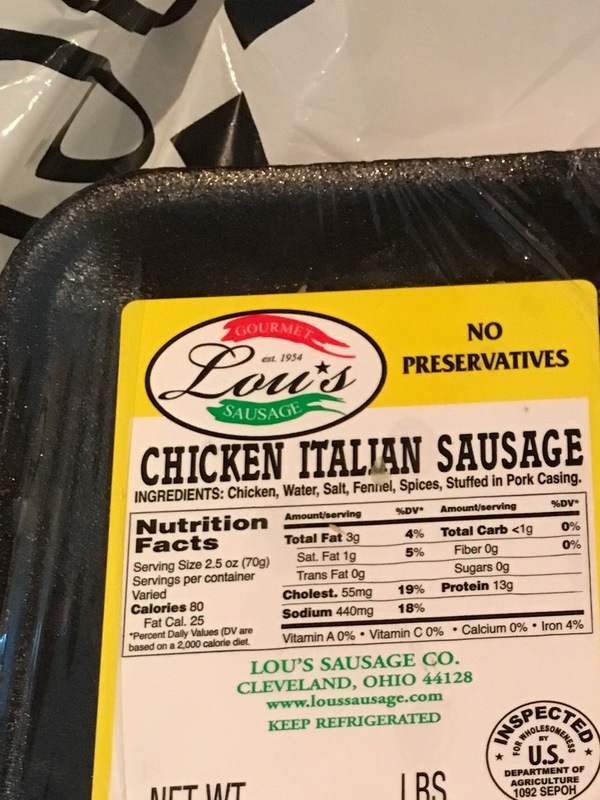 I was drawn to this sweet Italian sausage made from chicken breast as opposed to the more typical pork or sometimes turkey. It was reasonably priced, so into the cart it went! Fast forward to me making dinner the next night and deciding what to chuck into the pan along with my new sausage and some pasta. I went with tons of garlic, white button mushrooms, and some dry white wine that, in a recorded first, we had leftover in the fridge. It was heavenly and I think you’ll enjoy it as is. But I am also the guy who encourages you to play with your food! This recipe certainly doesn’t require farfalle, use what pasta you have or like. Not a funghi fan? Add some fresh or frozen veggies like zucchini or broccoli instead of the mushrooms. I would only encourage you to stick with sausage (meat or vegetarian), as that is what is providing so much flavor beyond the garlic and red pepper flakes. Otherwise, get in, mix it up, and enjoy!! Bring a pan of water to boil in which you’ll cook the farfalle pasta. Add the pasta and cook according to package instruction, usually 12-15 minutes for al dente. In a large skillet, warm the olive oil over medium heat and then add the roughly chopped mushrooms along with a pinch of the salt and the black pepper. Cook about 5 minutes until the mushrooms begin to soften and release their liquid. Add in the sausage, breaking it up as you add it to the pan. After another 5 minutes of stirring and breaking up any large clumps of sausage, add the garlic and red pepper flakes. Cook for a minute, then add the white wine (or chicken stock), black olives, the remaining salt, and ground black pepper. Bring to a simmer. When the pasta is cooked to al dente, reserve the pasta water, drain the pasta, and add the drained pasta to the sausage and mushrooms. Combine with the butter, parsley, the reserved pasta water. Let simmer a few minutes, this will thicken the sauce and allow some to absorb into the pasta. Top with some extra parsley or perhaps some grated Italian cheese or fresh basil before you serve and nosh!